Pop quiz - what is this? Sort of vaguely looks like some sort of mail glove with decoration, in a basin full of cleaning fluids? I'm not sure what the white thing is, but if that is a glove and that is cleaning fluid it's in, then I'd suspect either a cleaning pad or a fabric pouch full of soap? On fifth thought, you know, I think I had the scale wrong: it's looking more and more like a dress or coat or something, in a bathtub-sized container. The two short bits aren't little finger and thumb bits; they're sleeves. I think. Maybe. Funny how the mind can fool itself when seeing something unfamiliar. I don't mind lovely women with sheep fetishes. I start to worry, however, when the sheep is, so to speak, empty. . .
Looks like a bathtub with water, some kind of garment (a kimono? 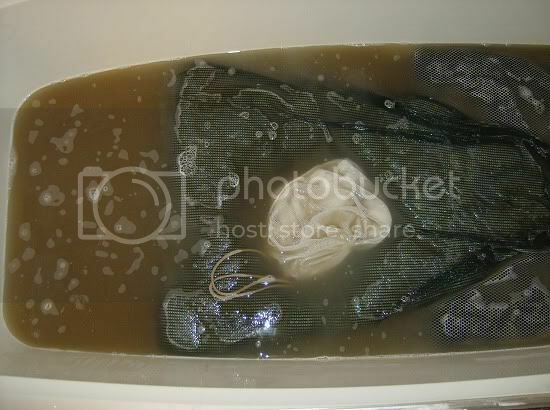 ), and a laundry bag with some kind of weight in it sitting on top of the garment to keep it in the water. But thinking about you and how you make your own yarns, I'm wondering if the garment is actually a bag with raw wool in it, being washed? It is, indeed, dirty wool water in the tub. Give that man a prize! I may even be able to collect the prize on the 13th or 14th. Current plans are for me to be in your fair city those days, assuming things don't go awry in the next couple of days. That would be lovely - please keep me updated. Once you know I will set aside a day to go into work early. I would be honored to purchase you the drink of your choice as a prize. I was once again washing dirty sheep in my tub. For some reason the tub of icky after the first soak struck me as amusing. I did end up with nice, clean fiber ready to be worked. It's a sack of... cormo. It is, indeed, dirty wool water in the tub. The little bag on top is misleading - it's just a double handful of 13 micron merino that had escaped washing with the rest of that fleece. I knew you would get it in about 2.3 seconds. The main show is some local fleece I picked up last year at Estes. Further, it is a lesson on what happens when I purchase fleece from someone other than my preferred growers. Normally there isn't close to this level of dirt - I only purchase the highest quality covered fleece. This Reserve Grand Champion Colored Fleece suckered me in - I had to have a couple of pounds. It was a covered fleece, but I think their coat program isn't as stringent as I'm used to. Hope you are having a good fiber day. I have some nice Clyde Special (corrie x) in the tub right now.